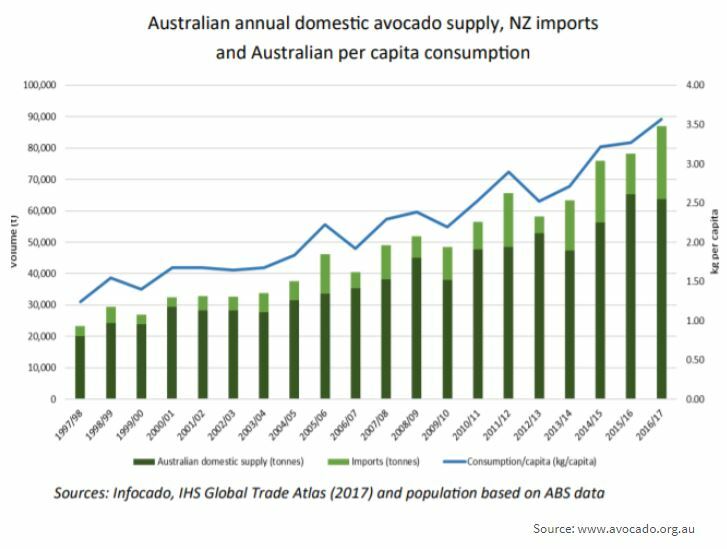 “Will demand maintain pace with supply?” Up until the last 12 to 18 months or so, we saw generally steady demand for viable avocado operations. However, in more recent times, demand has increased significantly and the market may be approaching its peak. Our general research supports the belief that over recent years there has been a substantial upswing in plantings, much of which is still to achieve full productivity. However, the issue will ultimately be “will demand maintain pace with supply?” The next 2 to 3 years will be a very important time for the industry to see how the expected upswing in supply will find a suitable market. We note that at present Australia is still in a net import position and is likely to continue to be at least in the short term. Australia is set to produce in the order of 75,000t in the 2017/2018 financial year but demand is still expected to outstrip supply to the tune of 10,000t or so. During 2017, Australians consumed in excess of 85,000t. As identified in the above graph, production is expected to continue upwards to in excess of 100,000t by 2024/2025. At the same time, consumption, as identified below, has also been trending up with New Zealand Imports to date filling the gap between domestic production and consumption. To understand where the market is going, we need to understand where it has been and where it is now. The Australian industry comprises approximately 2,028,000 trees that encompass a footprint of some 9,451ha providing for a density of 215 trees/ha. Of these approximately 2/3 are mature trees and 1/3 are 5 years or younger, supporting the belief that there is still significant potential for growth in supply which will flow through over the next 2 to 3 years. All things being equal this will equate to a 50% increase in production over the next 5 years or so as these young trees come online and go through to full maturity. 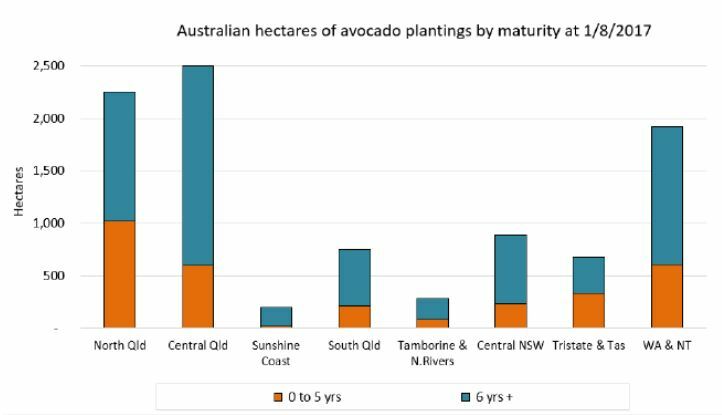 There are 8 main locations where avocados are grown in Australia. 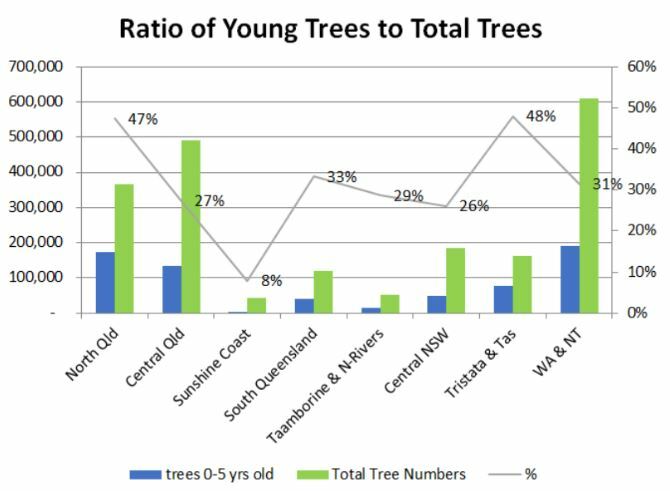 The above table identifies that by far and away Central and North Queensland dominate the industry with in excess of 42% of the total Australian tree numbers grown in these locations. Since 2007/2008, Australian production has increased from almost 7,500,000 trays to in excess of 12,000,000 trays as at 2015/2016. The biggest growth areas have however not been in Queensland, but rather in the majority of the other states; specifically Western Australia and the Northern Territory. Queensland over that period appears to have largely marked time. The Australian market is contained in 8 main regions. 7 of the 8 regions are in the main contained to the eastern seaboard. In 2007/2008 they accounted for in excess of 90% of Australian Production. With the emergence of the industry in Western Australia, this percentage has reduced to 65% with Western Australia and the Northern Territory now accounting for 35% of the Australian market. Whilst other regions that have experienced growth to varying degrees, the growth in production in Western Australia has been circa 650% in that time. Other than North Queensland which has experienced a growth rate of circa 200%, the balance of Queensland including South Queensland has largely flat-lined over the 9 year period. 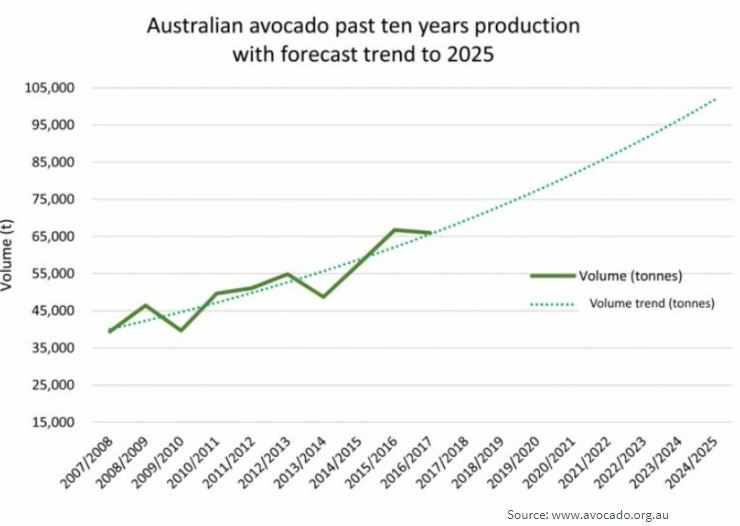 Over the course of the last 8 years since 2007/2008 to 2015/2016 inclusive, the Australian Avocado Industry has experienced year on year growth of approximately 6.5%. Whilst this is quite phenomenal, one of the issues facing the industry going forward may well be one of oversupply and at what point does this exceeds current demand. Because there is still the potential of significant production to come online given the high % of trees that have been planted over the course of the last couple of seasons, finding a home for the expected increase in production will be the biggest challenge. Whilst there is no doubt there is still capacity within the domestic market, our “clean green” image may well provide the opportunity to open up new export markets; however securing such markets cannot be done overnight. Given this, there may very well be some “speed bumps” ahead for the market in the short to medium term. To highlight the expected growth in production in the coming years, we have compiled the following graph which plots the ratio of young trees to total trees for the various production regions in Australia. Not all of the expected growth in young trees will be additional plantings, however. There are always some losses experienced in an orchard due to disease or the necessity to thin to improve density. There is also a small percentage of planted young stock that do not survive the critical first 12 months after planting. Whilst the majority of locations are positioned within the 25% to 35% range, North Queensland and Tasmania are significantly higher. Whilst this rate is not expected to create issues in Tasmania or the broader Australian Market because of the very low base of trees within that state relative to other locations, the same cannot be said for North Queensland. The increase in North Queensland plantings is coming from a very high base. Further, production from North Queensland is usually the first to come onto the market and therefore the potential of some initial oversupply issues within the Australian market cannot be discounted. When considering the expected future growth in production as identified above, the timing of the crop coming onto the market is critical. As with any other horticultural crop, early season crop generally appears to achieve premiums in the market. It would appear therefore that the significant increase in plantings in North Queensland has been designed to capitalise on the fact that production from there hits the market first. With the expected upswing in production out of North & Central Queensland in the coming years, much of this crop will “hit” the market from April onwards. This may impact returns ultimately impacting on the viability and value of an operation unless demand (domestic or export) grows to accommodate. Looking for more information on current rural property? Download our May Month in Review or subscribe to monthly reports here.